I was going to make this the “back in the saddle” edition of Motivation Monday, in a reference to me trying out my new bike seat, new helmet and new wrist on my first post-wrist surgery bike ride on Saturday. I’ve always been a skittish cyclist, so even once my doctor cleared me for all activities last month, I was flat-out scared to get back in the saddle, lest I re-break my wrist, or break something in my body that isn’t titanium-reinforced. 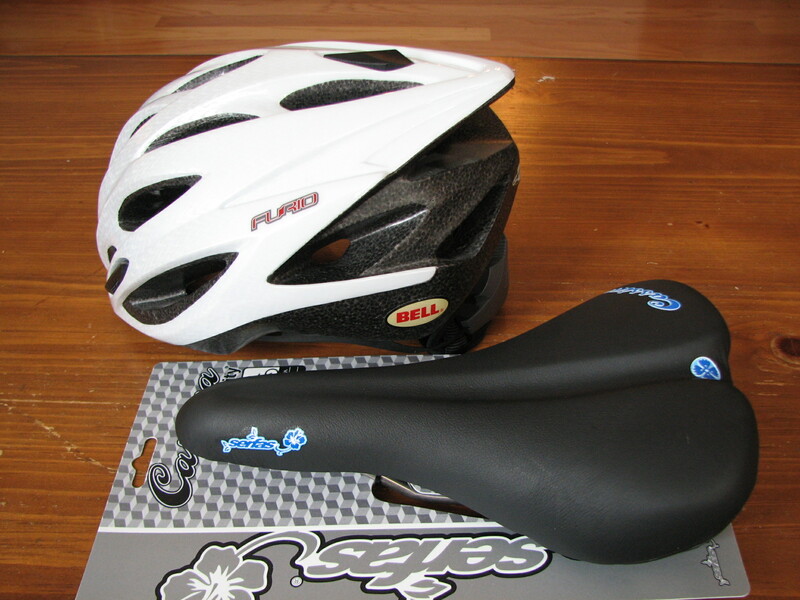 My new bike seat and helmet, purchased in January, finally used on Saturday. But getting back in the saddle is boring and cliched, and represents kind of a lukewarm attitude, begging the question of what happened once I was actually *in* the saddle. In addition to a new bike seat, I also got to use my favorite old bike shorts, by a brand called Shebeest, which is exactly the kind of persona I channeled when I made a conscious effort to do something that scared the crap out of me. 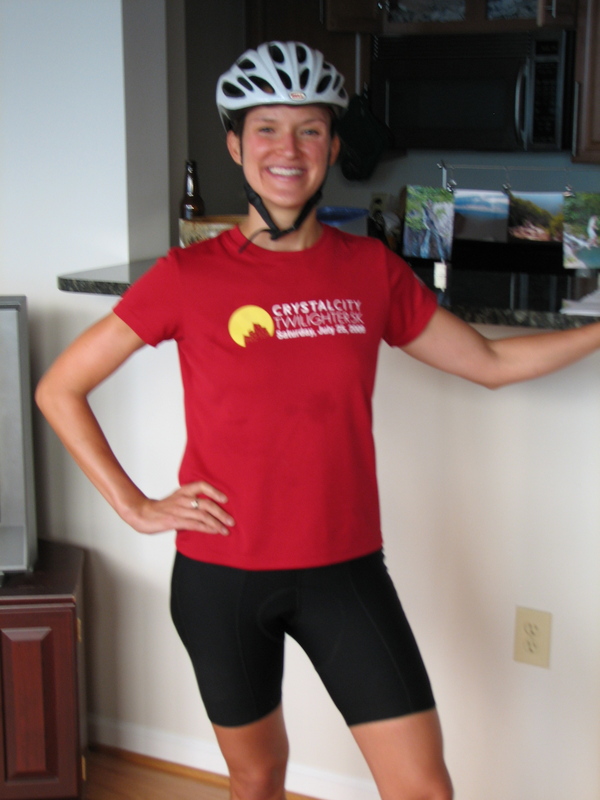 Looking dweeby but victorious in my Sheebeests after our ride Saturday. It started with a simple ride to the Silver Spring Farmers Market. I wore my splint there, shed it for the ride home, and had so much fun, I recruited Steve to join me for a longer ride in the place of my scheduled swim. We both enjoyed zooming through the sunny, arid, 80-degree weather on a 10-mile trek on the Rock Creek Hiker-Biker Trail. I enjoyed getting to unleash my inner Shebeest—an occasional necessity in training and in life. A painful, but ultimately successful, 10-mile run Sunday morning. After being so smart about pacing last week’s 10-miler, I fell into the same trap that’s defined most of my longer runs this training cycle: the “but 8:30-minute miles *do* feel easy and conversational!” trap, which left me sputtering through my final miles on Sunday. I felt like crap chugging up the last, long, uphill mile, but was pleased to find that I still averaged right around 9:30-minute miles, about par for the course this training cycle. Kara Goucher’s blog. I had no idea this existed. Now that I do, it’s totally rocking my world. …and wilmington is a nice quiet little town for enjoying a weekend. Hm, what’s motivating me after a step-down week? Two nats games in one week? Massage next Saturday? Probably more like my relentless stubborn streak that insists I am making progress simply by making it through training another week. Nice!! Love the new helmet and I dig those bike shorts. I am going to check them out. I am glad you liked that quote. It’s a great one for sure!!! Haven’t heard of “Shebeest”, I’m guessing the brand gets a thumbs up? 🙂 Glad the inaugural rides went well!! SheBeest is fabulous! It’s the only brand I’ve found whose bike shorts leave me sore only in the *good* spots after a long ride.